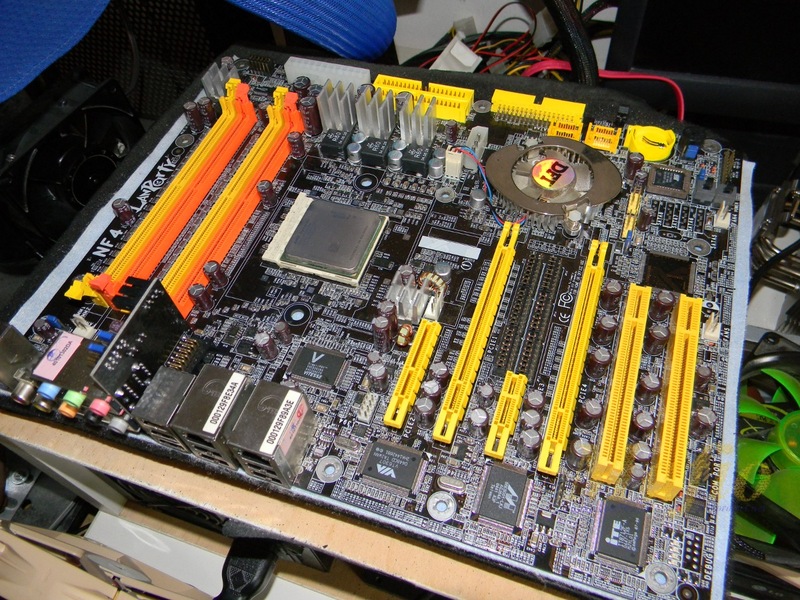 Two weeks ago or so I bought a DFI nForce 4 Ultra-D, when it was here I had some fun playing with an old Athlon 64 3000+ core Winchester and some crappy DDR modules. 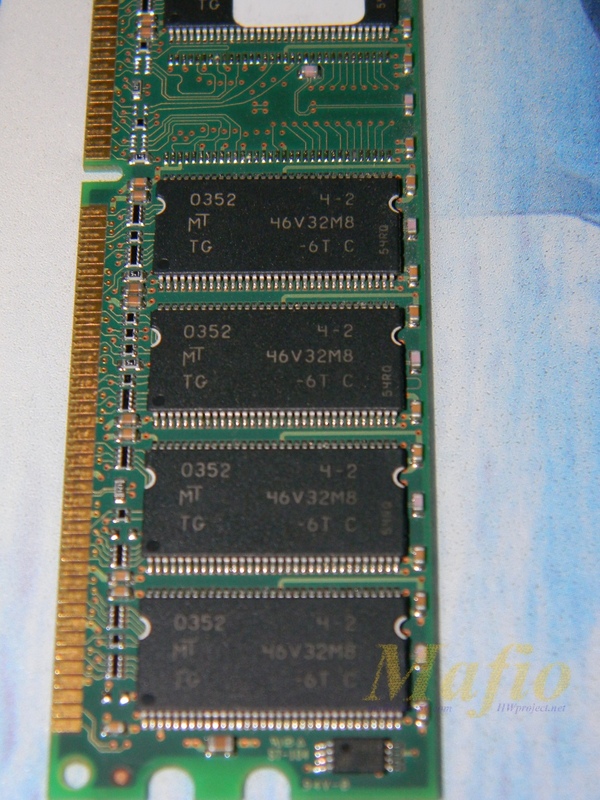 I had also a bunch of Winbond BH-5 kits, too bad they are all dead or semi-dead, so I had to stick with a kit of Micron value PC2700 cas 2.5. 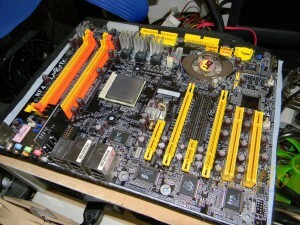 Luckily a friend of mine was so glad to send me a kit of Corsair PC3500 cas 2 BH-5, so in the next few days I will have a decent kit of RAM to play with super-pi. 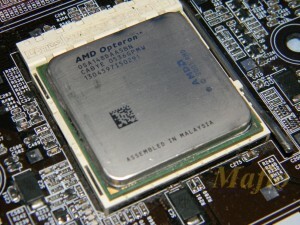 Other than this, 1 week ago I bought an Opteron 148 for 8.49 € plus 1.50 € of shipping cost, yesterday it arrived. At a first try it was good for 3200+ MHz aircooled, so definetly deserves a try at lower temperature. 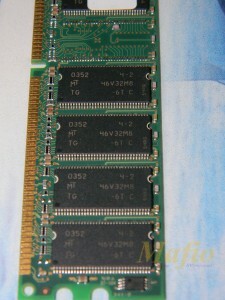 Also, this is a shot of the Crucial value RAM. Despite being “just” a value kit these Crucial are quite interesting, with 4 volt they are able to reach 297.3 MHz 3-4-4-9 and up to 250 MHz 2.5-3-2-6 1t super-pi 1M stable. 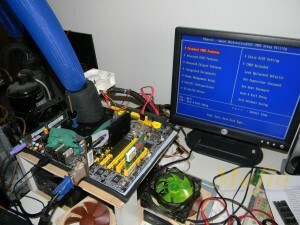 During my first week with this DFI I tried many things, one of these is maximum HTT clock. 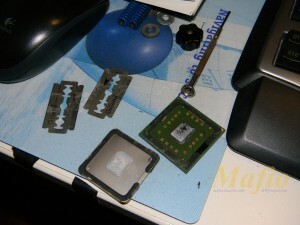 Yesterday, with the new CPU in my hands, I did tried it at single stage. Luckily this time no CB or CBB, even better the CPU loves cold, Single Stage is not enough…will give it a try at LN2 for sure. Today I found some more time to try some more things. One of these things was a different BIOS, the latest official (623-2, BH-5 version) seems to be the best so far. The biggest news is that finally I can feed the CPU with up to 2.05/2.1 volt, the other news is that I did it. CPUZ online validation in these last days is totally messed up, I hope they will fix it as son as possible. Got some more time to play with the CPU today’s evening, seeing that there was no way to get higher frequency I decided to take off the IHS. I already did it in the past to a XEON E3110 and some Pentium 4, both of them with soldered IHS, so really wasn’t a big deal to take off the IHS from this Opteron. Dusted off the 2 razorblades I use for this kind of things and in 20 minutes or so the IHS was popped. 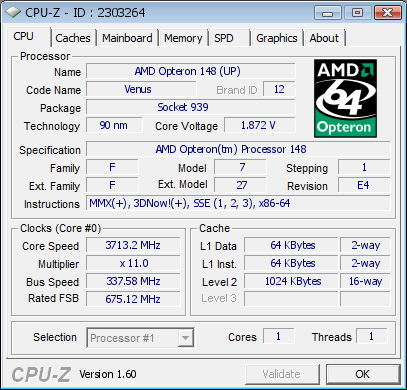 Same settings as before, but naked CPU results in a 60 MHz gain. Not bad at all. I think the CPU has some more in it, we will se.